We carry our phones with us everywhere we go — whether it be our living room or workspace — so why shouldn’t we venture into our kitchens with them? Recipe apps are the next step in the complete mobile takeover, offering step-by-step instructions on how to make a fine oven-fried chimichanga, curate a weekly meal plan, and even getting you prepared for the future of food. The app market is loaded with both premium and freemium offerings for both iOS and Android. Some cater more to the executive chef at your local five-star restaurant, while others help those of you who are still learning to dice an onion or boil water. Here is our top pick for one of the best recipe apps, regardless of your kitchen expertise - Recipe Pie. 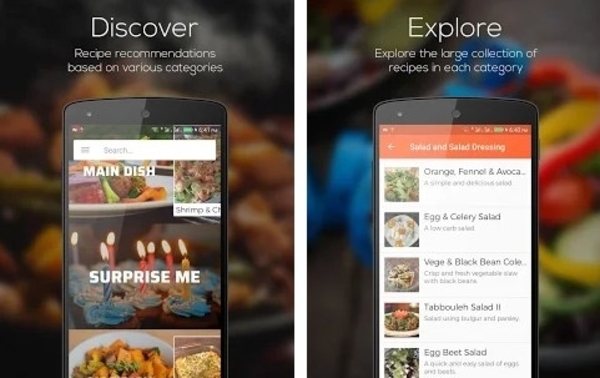 Recipe Pie is an incredible and feature-rich recipe app for all Android home cooks. If you’re looking for a user-friendly, intuitive and all-in-one cookbook tool to have in your pocket at any time, Recipe Pie has got you covered. Whether you’re planning to throw a casual party or a formal dinner party that app will give you delicious ideas on what to cook. Keep reading to see what it offers. With the Recipe Pie app users can easily discover recipe recommendations and enjoy a huge collection of recipes organized in various categories. Actually, the categories featured are: Appetizers, Soups, Main Dish, Side Dish, Baked, Salads, Sauce and Condiments, Desserts, Snacks, Beverages, Breakfast, Lunch, etc. There are over 3000 delicious recipes featured, for different tastes, cultures, nationalities and different occasions. To get a meal inspiration out of the app, all you have to do is choose a category and start browsing for what you like (or press the Surprise Me button and it will show you random recipe). Then, follow the step-by-step cooking instructions and view other details about the recipe, such as: nutrition info (information about vitamins, protein, carbohydrate, fat, sodium, potassium, cholesterol, calcium and iron), preparation time, cooking time, number of serves and ingredients. Each recipe is presented with an image, name, and a short description, to make it easier for you. Additionally, Recipe Pie lets you save the recipes you like to your list of Favorites, share the ones you want with friends and family and gives you daily food quotes. The best thing about the app is that it’s absolutely free for download. You can get it right away from the following Google Play link.